I'm creating a WebGL application using Unity written in C#. I have a function that logs the user in based on an authentication token (allowing the user to skip the login screen if they've signed in previously and have a cookie). I have also attached a screenshot of the error I receive in Firefox below. It seems to me that Kii is doing some sort of threading. 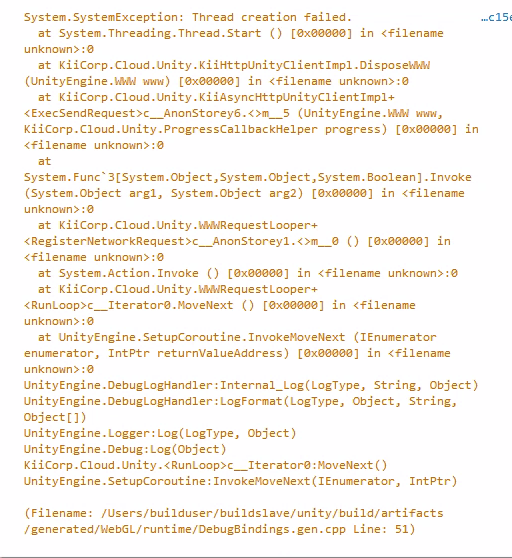 I've read online that WebGL does not support threading.. however, I do not have a good understanding of what Kii is attempting to do! Does anyone have experience implementing this logic in their application? I'm able to keep my application running if I have exceptions enabled in the Unity build settings. Although, this is surely not a permanent solution! If anyone has any suggestions or would like more information about my build settings please ask. Unfortunately our SDK does not supports WebGL.